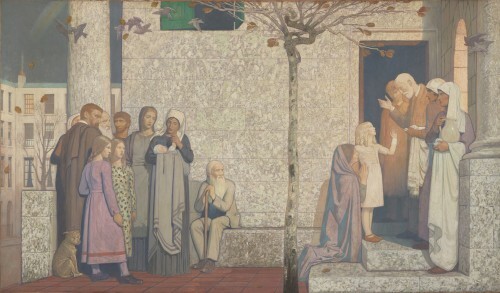 Frederick Cayley Robinson was, among other things, a Symbolist painter, a theatre set designer and book illustrator. But he is now most famous for his series of paintings called Acts of Mercy which are the subject of a new exhibition at London’s National Gallery. The gallery goes so far as to say that the paintings “rank as the most important decorative commissions of the early part of the 20th century”. They were a gift to the Middlesex Hospital from Cayley Robinson’s patron, Sir Edmund Davis, a wealthy Australian industrialist and benefactor. Commissioned for the hospital in 1912, they were painted between 1915 and 1920 and placed, firstly, in the reception area of the Georgian hospital building in Mortimer Street, Fitzrovia. They then occupied the same position in the rebuilt hospital from 1935 until 2007. They came under threat of being sold abroad at auction as it was felt they would not sit well with the modern style of the new University College hospital which had already merged with the Middlesex. Salvation came in the form of the Wellcome Trust in January 2009 after it purchased the paintings for £235,000. Two of them were placed on permanent display in the Wellcome’s library, and two were available to view by appointment in the trust’s storage facility. Now all four are on display again to the public at the National Gallery until 17 October 2010 in the first exhibition devoted to the artist since 1976 and, when seen together like this at close quarters, they possess a strange, ethereal quality, typical of the Symbolists with their love of allegory and opaque signs, but at the same time pre-figuring Surrealism in their languid, dream-like atmosphere. 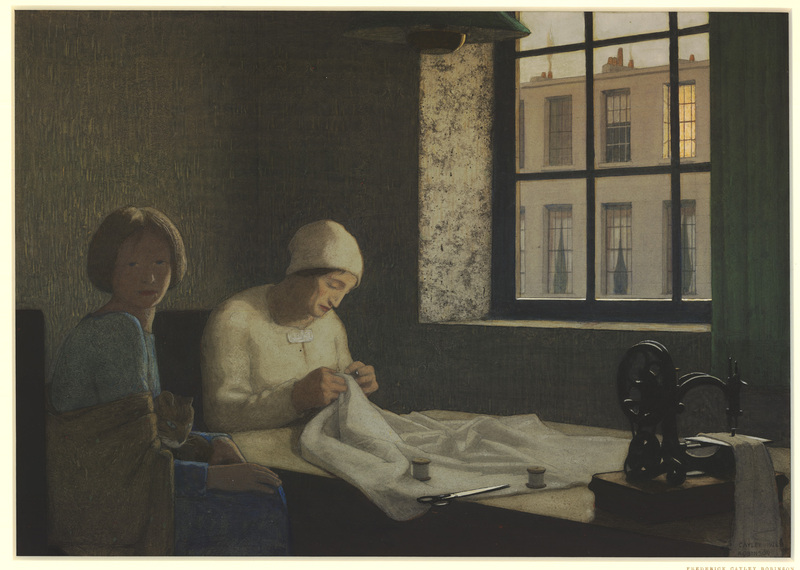 The works depict two themes – an interior pair called ‘Orphans’ and an exterior pair known as ‘The Doctor’. The former were hung alongside each other while ‘The Doctor’ pairing faced each other across the Middlesex Hospital entrance hall. They would have been gazed at for decades by patients, staff and visitors, many of them smoking although the varnishing and glass shields helped preserve their condition before the Wellcome had them cleaned. Some, like hospital consultant J H Baron said “my life was made happier by the presence of these paintings” and nurses have spoken of the relief of seeing them after finishing a gruelling 13-hour night shift. Cayley Robinson was magpie-like in his influences, harvesting stylistic and thematic devices from the Italian Masters to French Symbolist Puvis de Chavannes to the pre-Raphaelites. 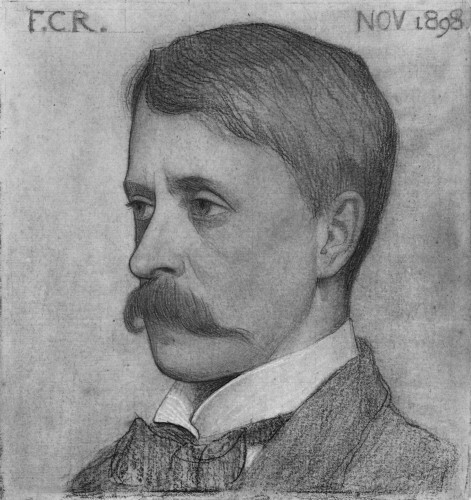 He moved to Florence in 1898 for three years, studying the great Renaissance artists, and the exhibition visitor is first greeted by examples from the National Gallery’s own works of the period which clearly demonstrate his influences. So the figures in Piero della Francesca’s The Baptism of Christ (1450s) seem to be fixed in time, impassive and pale like the wounded soldiers seen in ‘The Doctor’ and Cayley Robinson appears to have drawn inspiration for his frieze-like arrangements of figures set in a defined space from Boticelli’s Four Scenes from the Early Life of St Zenobius (about 1500). 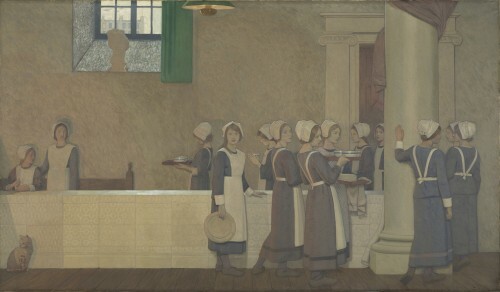 Hospitals traditionally cared for orphans and the first pair of paintings (both 1915) depicts a scene in the hospital refectory.The young girls descend a staircase on the left, and this in itself is an homage to pre-Raphaelite artist Edward Burne-Jones’s painting ‘The Golden Stairs’ (1880) currently on display in Tate Britain’s British Art section. The burning orb of the lamp picks out a woman in a floral dress standing in the corner, and emphasises the importance of light and shade in Cayley Robinson’s work. The girl seated at the left turns to face the viewer, the only figure in the painting to do so. She could be curious, sad or resigned to her fate, perhaps all three. This is part of the enigma of Cayley Robinson’s allegorical world. To the right, milk is poured from a jug into a bowl and the scene continues in the second painting of the two with a cat observing the act. The high window contains a bust of Hypnos, the Greek god of sleep, who inhabited a dark, sunless cave. He is associated with dreams and again the painting inspires questions to which there can be no certain answers: are the orphan girls living a dream? Should they just sleep their life away? Is this a haven of calm repose until they have to venture into the world and earn a living? 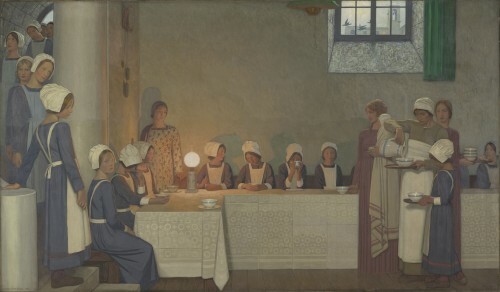 It is possible the last point is implied as the figures on the left of the first ‘Doctor’ canvas as originally hung (1920) depicts young nurses dressed in very similar fashion to the orphan girls. Painted two years after the carnage of the First World War, the damaged veterans appear shell-shocked and forlorn, staring into the distance, non-communicative. Some of the soldiers wear slippers, one is on crutches and bandages abound. To the right stands a dandy-ish figure in overcoat and top hat. Although he has been described as possibly tubercular, it seems more likely that he could be the artist himself, a marginal observer of the scene. The military equestrian statue behind him can signify anything from the futility of war to the fact that this is a military hospital. The soldiers, all ‘other ranks’ or non-officers, are mostly dressed in ‘convalescent blues’, the standard uniform of wounded soldiers in the 1914-18 war. The trousers and cuffs have been turned up in some cases, a small but telling detail. The flannel uniform was made in just a few sizes for cost reasons, often resulting in a poor fit which the soldiers adjusted as best they could. The red tie was part of the uniform and there were no pockets in order to save money on cloth and also because soldiers were not allowed to have money in hospital. Officers were exempt from wearing ‘Blues’ and had a personal clothing allowance or even silk pyjamas donated by the public and aid agencies. It is significant that Cayley Robinson only chose to portray the other ranks in this work. To the far right, a bright light shines in a Fitzrovia town house window while behind, high chimneys belch out black smoke. These could be power stations or even armaments factories, constantly fabricating weapons of destruction, helping to perpetuate the scenes we see here. 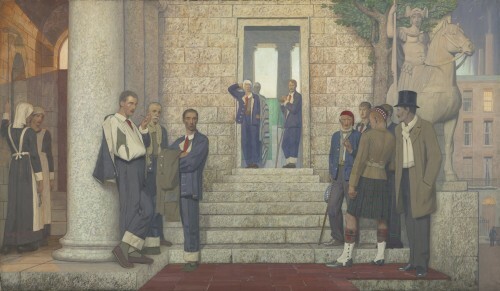 The final painting of the group – ‘The Doctor’ of 1916 – shows a group of men, women and children of various ages on the left. The cloaked figure could again be Cayley Robinson himself. On the right, an aged doctor appears in Christ-like pose, seeming almost to give benediction to the young girl whose wrist he has treated. Her mother kneels in supplication, a pose reminiscent of many Marian figures in Renaissance art. In the centre, a near leafless silver birch is similar to those painted by Mantegna, another Renaissance Master and typified in his Agony in the Garden of 1455, also in the National Gallery. A nurse holds a pitcher of water, symbolic of Hygeia, the daughter of Asclepius, the Greek god of medicine and healing. Hygeia was associated primarily with preventing sickness and maintaining good health. To the left, once again, is the steeped Fitzrovia townhouse with its solitary lit window, a beacon against the darkening night sky. A similar image also features in the exhibition in Cayley Robinson’s The Old Nurse (1926, British Museum), this time from across a Bloomsbury street but still depicting the solitary glow from a window contrasting with a darker interior, as in ‘Orphans’. Again the theme is the care of the young for the old, a constant in the artist’s work which speaks of his empathy for his subjects and the roles they fulfil. And, in an ironic postscript, it seems that two of the paintings will go on display at University College Hospital after all when its new cancer centre opens in 2012. Cayley Robinson painted Acts of Mercy for public display and now, and for the foreseeable future, the public can view these original and intriguing works of art in appropriate locations, as opposed to being hidden from view in an American millionaire’s mansion.